The Vice President of a large Orange County homeowners' association wants the State to change its rules about cable TV. Right now homeowners in Avalon Lakes don't pay cable bills , the HOA does. 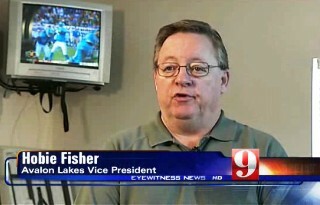 And Channel 9 News reports that the HOA got locked into the cable contract by the neighborhood's developer. Hobie Fisher occasionally enjoys some down time in front of his TV at his home in Avalon Lakes where he is the HOA vice president. Around here TV is no longer enjoyable for many. "Nothing we can do! It's the sweet deal they signed with the cable company," says Hobie Fisher. "I'm going to the state legislature and we are going to plead the case. We are going to ask them to prohibit future developers from signing long-term contracts for HOAs and condos. It's not fair!" At one point the association was too much behind paying its cable bill. Now the bill is up-to-date but they are worried it won't be too long.